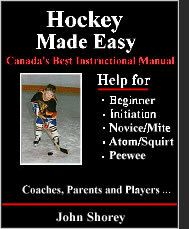 Hockey Made Easy is Canada’s premier manual on how to play better hockey. It's a training instruction .pdf e-book. Guaranteed to make you a better coach, parent teacher and player or you get your money back! 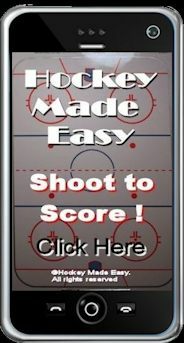 What content is in "Hockey Made Easy" ? Published to help both coaches and parents teach young players in Beginner, Initiation, Novice, Mite, Atom, Squirt and Pee Wee Hockey. Written in an easy-to-read, so the information can be easily transferred to your young players to help develop their individual and team hockey skills and knowledge whether playing in a House League or ‘AAA’ Rep Team program. This will enable dedicated parents and coaches to teach your son, daughter, or players, in a specific teaching sequence, at your home, in a classroom, gym or large hall, or on the ice at your practices. A vast list of hockey terms and expressions.